Directly after I left the narcissist, I realized that I couldn’t trust any of our mutual friends. Immediately, my world got smaller. From the very start, I didn’t have many people I trusted. I’d already come from a narcissistic family, which was why I’d been so vulnerable to another abuser. I already had very few to no people looking out for me or supporting me. After I split from the narcopath, I realized that most of my friends were not really my friends if they knew he had abused me, but they weren’t willing to speak out against it or support me in my time of need. There is NO middle road and there are NOT two sides when it comes to abuse. There is not blame on both sides, and there is no room to try to stay neutral. An abuser is an abuser and the victim is the victim. That simple. In a normal break-up, the fault is two-sided, but with an abuser, it is ALL on the abuser. So there I was with hardly any friends that were just my friends and not the abuser’s as well. Straight out of the abuse, when I was severely traumatized, I was leaning on that small group of people very, very heavily. But then, one by one, the sociopath targeted them. Most of them fell for it and ceased to be my friends. Many of them became my enemies who started smearing me for the abuser. I got more and more desperate for people I could trust and people who could listen or give advice when I was feeling most stressed with the ongoing third party abuse. As the number of people I felt safe talking to got smaller and smaller and smaller, I became less picky about who I would accept as a new friend. I started confiding in people I’d never really talked to before simply because I knew they were not friends with my abuser. I started posting honestly online about what I’d gone through. I had no one to turn to. I learned that when you are hurting, traumatized and vulnerable, you will attract more sociopaths–especially when they have such easy access through social media. There are people out there who are like vultures. They see a wounded person, and they swoop in to finish the kill and destroy that person emotionally. There are people in the world who enjoy torturing strangers. They see weakness, and they enjoy it. 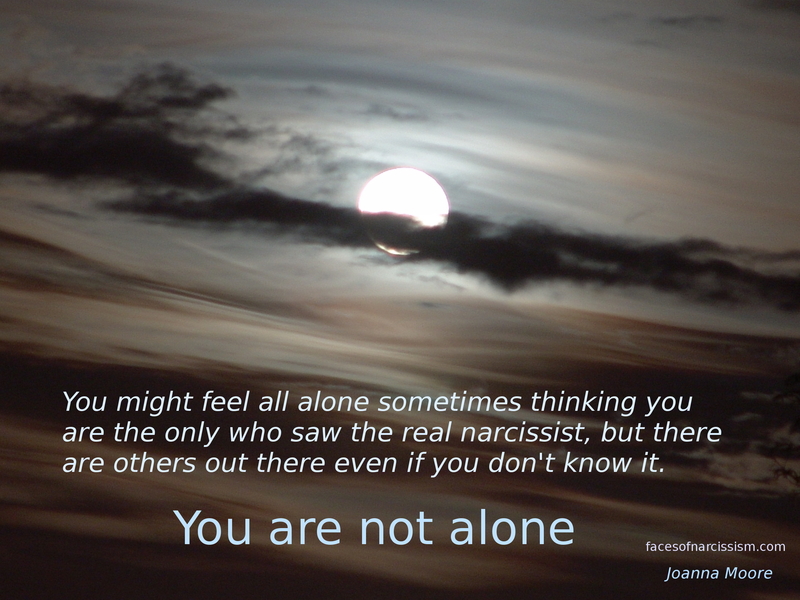 Leaving a narcissistic abuser leaves us with multiple traumas. Already we’ve been abused–and quite often in a non-physical way which means that people don’t believe us. But then, right when we need people the most, the abuser makes sure to destroy our support systems. That leaves us hanging and desperately seeking support and friendship–often in unsafe places. So we find ourselves in our very darkest times with fewer resources and friends than we’ve ever had in our lives and yet we need help and a friendly shoulder to cry on more than ever. If we reach out to the wrong people, we find ourselves further bullied and traumatized. Just having been abused makes us significantly more likely to experience it again. We need to learn to have very strong boundaries, and we need to learn to be wiser about who is trustworthy and who isn’t, but it’s a hard lesson to learn when we are desperate for support. When we are in fight or flight situations with adrenaline pumping and fear rising, we know we need safety fast. We don’t always stop to think with the more developed parts of our brains because we are in survival mode. And so we turn to anyone who seems the least bit friendly. And quite frequently, that person who seems nice at first is just another bully drawing us in. Truth. 100% of the “friends” from our social circle before the narcopath discarded me sided with him. He smeared me to the husbands of these “friends” for a solid year before he left, and when he walked out, it was crickets. Not one contacted me to see if I was okay. I have no use for any of them. They are still, I assume his supporters and sympathizers. Good riddance. The level of isolation I felt during my divorce was staggering, for the same reasons. I had always been a very private person, and I did not spread around gossip about him, but people were so eager to believe anything he said about me. It felt like my life was over. But it wasn’t. This is what happened to me. Even if I did warn my former friends about my ex, they would still believe them because I know that they will try their very best to make my former friends doubt our friendship and lie about me.